Oshkosh Stock: No Longer a Sell, but Not Yet a Buy? Here are three things you need to know -- plus a bonus thing at the end. Friday was not a good day for Oshkosh (NYSE:OSK) stock. Luckily, Monday is looking a bit brighter. On Friday, Oshkosh closed out the week with a bleak press release predicting that it would earn at most $3 a share this year, and could earn as little as $2.85. (Analysts had been expecting $3.56.) Although Oshkosh tried to spin the news as positive, and a raising of its own guidance, investors accentuated the negative -- and sent Oshkosh stock down 10%, rendering the stock one of the worst performers for the month of September. On Monday, however, investment banker Credit Suisse chimed in with its own thoughts on the coming year-end report. Calling Oshkosh's sell-off "overdone," the analyst argued that Friday's announcement actually removed the risk of further bad news from the stock, and means Oshkosh is no longer likely to "underperform" the stock market from here on out -- and no longer a sell. Oshkosh makes MRAPs. Lots and lots of MRAPs. Image source: Oshkosh Corporation. Prior to today, Credit Suisse had counseled investors to sell Oshkosh stock. Its theory: The company's access equipment business (which according to S&P Global Market Intelligence accounts for more than half the company's revenue) "was at peak and rolling" over. Now that this fear has been confirmed, however, Credit Suisse says "the market fully appreciates" the downturn in access equipment. Thus, there's no further risk of a negative surprise. To the contrary, now that Oshkosh has defused the potential landmine of access equipment blowing up its income statement, it's safe to begin digging for good news at Oshkosh. As explained in a write-up on StreetInsider.com this morning, Credit Suisse sees two potential places to search for such good news. 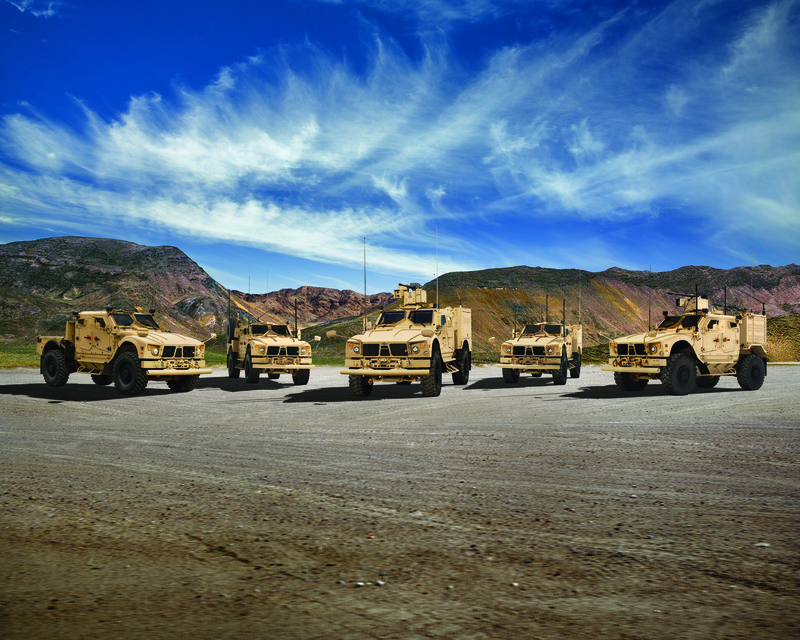 First, Oshkosh's success selling Joint Light Tactical Vehicles to the U.S. military, and the additional business Oshkosh has won selling M-ATV armored cars internationally, are both "underappreciated," and will "help support [earnings] in the Access downturn." Secondly, Credit Suisse predicts that Oshkosh will enjoy "market tailwinds" in its commercial and fire and emergency divisions. Only half the size of access equipment, these two divisions, when combined with the booming defense business, make up nearly as much revenue as the flagging access equipment business. They do indeed have the potential to offset weakness in the flagship division, and keep earnings on track. 3. Precisely how good is this good news? Here's how Oshkosh calculates it. At the midpoint of its new guidance, Oshkosh thinks it can earn $2.92 per share this year on about $6.15 billion in revenue. Next year, the company anticipates growing those numbers to about $3.20 and $6.6 billion, respectively. That works out to about 9% earnings growth and 7% sales growth -- relatively modest, achievable targets for the industrialist. So does all of this add up to a strong buy argument for Oshkosh stock? Honestly, at 9% earnings growth, probably not. Oshkosh stock currently costs more than 19 times earnings. Even with a 1.9% dividend yield factored into the mix, it would be hard to argue the stock is worth 19 times earnings on a percentage growth rate half that size. That said, Credit Suisse thinks Oshkosh's growth will accelerate in coming years. The analyst calculates likely per-share earnings of $2.95 this year growing a bit faster than Oshkosh is promising -- to $3.30 in fiscal 2017. The analyst further extrapolates $3.40 per share in earnings for 2018, and $4.60 for 2019. With a bit of calculator work, you'll see that this works out to about a 16% growth rate on the stock. Add the 1.5% dividend yield, and Credit Suisse appears to be predicting a 17.5% total return on the investment -- which is in fact a decent return on 19 times earnings. Not a great return, mind you, but a decent return, and enough to merit lifting the analyst's sell rating on Oshkosh stock, and replacing it with a neutral recommendation and a $54 price target. So, long story short? Oshkosh stock is not quite cheap enough to start buying just yet -- but it's no longer so expensive that you need to sell it. That's Credit Suisse's view -- and mine, too.